It is breakfast time in the campo. The electricity is back on again, so we are watching the news out of Bogota on television while we eat. An ongoing story this week is the big protest in a town of a 150,000 people called Yopal, Their potable water treatment plant went down a couple years ago, and the city government has received funding, but hasn’t started the repairs yet. Protesters are railing and burning vehicles in the street. Commentators are noting the blatant incompetence of officials and the injustice of not having access to clean water. And I’m wondering how my host family is taking all this in. I’m back in the village of Buenos Aires next to the Las Pavas plantation that I have visited several times over the last few years in our accompaniment of their land title dispute. Buenos Aires has never had a potable water system, although they have a big cement water tower that was completed seven years ago. Three guys showed up recently and started building the concrete tanks that will serve as the filter system. Until the well and treatment plant are up and running the community will get their water from the Papayal River as they always have. The river runs directly behind the Payares family home. Misael, Edith, and their extended family have hosted me several times. 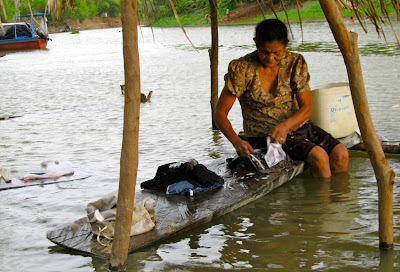 When I arrived the day before, I had gone down to the river to visit with Edith while she washed clothes. 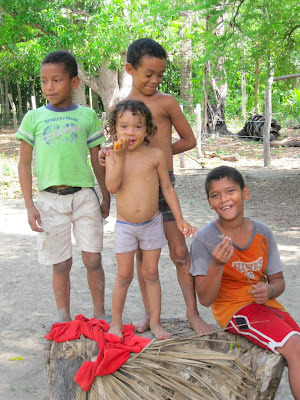 The little neighbor girl was showing off with underwater handstands while giant seed puffs floated down from the White Ceiba tree above us. This is where I bathe while I’m here, like everybody else. This is where Misael’s son throws his huge, circular cast net fishing for Boca Chico, Bagre, and Mojarra. This is the river that is seeing levels of mercury rise from the gold mine tailings upstream, levels of herbicides rising from the mono-cropping of African Palm, and the numbers of fish dropping. When I ask the family how they feel seeing potable water being talked about on TV as a basic right, they nod, and they continue to eat. There are plenty of other things to worry about, like how to feed your kids when the palm company workers keep cutting down your crops, knocking down farm homes, and stealing your barbed wire fences. Thanks for sharing photos and experiences. The injustices are so frustrating with such political and economic powers fostering and upholding them. The greed and alienation is worldwide. Thank you for being the 'pesky horsefly'. Know you are remembered in prayer; we do our best to wake up friends, neighbors and politicos--the latter are most deliberately closed. Total agreement with Anonymous. Without the love, hope, and power of God, the problems of the world are impossible. With God, all things are possible. Jim L.